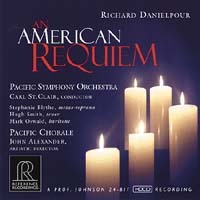 Reference Recordings was recently honored to record and produce the premiere recording of an exciting new work by American composer Richard Danielpour, An American Requiem, which is dedicated to the lives lost on September 11. It was commissioned and premiered by the Pacific Symphony Orchestra and the 150-voice Pacific Chorale. The "Prof." Johnson HDCD recording was made with the original cast in Segerstrom Hall in Costa Mesa, California, home of the Pacific Symphony.